FoBCFC donates almost £10,000 to City community projects! Friends of Bradford City in the last few weeks have donated almost £10,000 to City projects. The money has been split between Bradford City Women’s Football Club and Bradford City Community Foundation. Bradford City Women's Football Club provides opportunities for women and girls of all ages to train and play football at the highest possible level in the English football leagues. They are one of the biggest women's football clubs in the area and welcome players of all ages and ability. The club is run by a willing band of unpaid volunteers. Bradford City F.C. Community Foundation was set up in 1988 by the PFA. Their initial aim at that time was to promote BCFC in the community by increasing the fan base and awareness of the Club. The Community Foundation works within schools, but over the years has extended it's reach into the community working with groups and individuals of all ages, races, backgrounds, beliefs and abilities and is a well-liked organisation in the community. These funds donated by Friends of Bradford City will go a long way and be spent within the wider Bradford City community on very worthwhile projects. FOBCFC end the season with POTYA! The Friends of Bradford City hosted the Player of the Year Awards to end the 2017/18 season. The event which was hosted by Pulse 2 Commentator Jason Thornton & Bradford City Announcer Liam Scott brought supporters, sponsors, staff and players together and saw Matt Kilgallon walking away with the majority of the awards on the night. The Bantams defender Matt Kilgallon won The Telegraph & Argus Player of the Year, JCT600 Player's Player of the Year, FOBCFC Player of the Year, The Telegraph & Argus Most Consistent, Shipley Bantams Player of the Year, East Bierley Bantams Player of the Year and White Abbey Supporters' Branch Player of the Year. Tyrell Robinson, who signed from Arsenal last summer also walked away with 2 awards, Pulse 2 Commentary Moment of the Year for his goal against Wigan Athletic and Supporters' Trust Under 23s' Player of the Year. 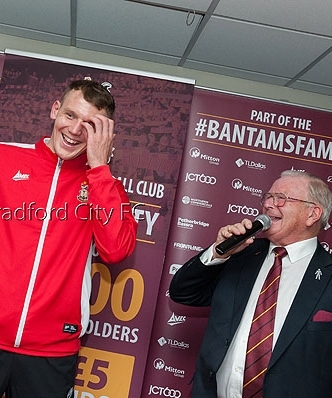 Meanwhile City shot stopper Colin Doyle claimed Bingley Bantams Player of the Year and Romain Vincelot won Bradford City PFA Community Champion. On the evening Bradford City Joint Owner Stefan Rupp awarded Julie Stainthore and Jean Calvert for their work with the Junior Bantams with The Chairmans' Special Recognition Award. 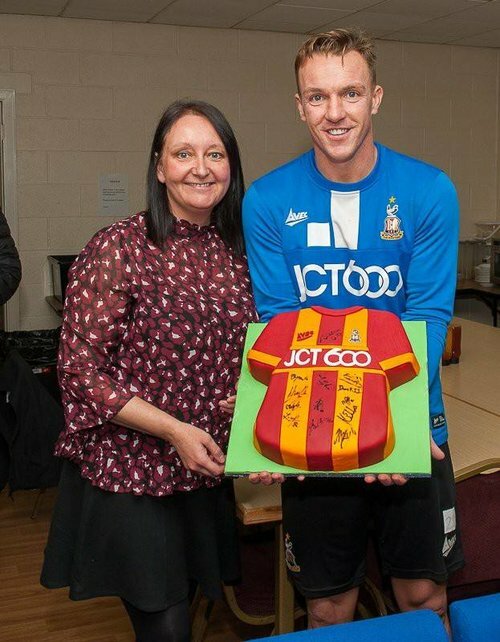 Cake That Bradford recently teamed up with Tony McMahon who chose to help raise money for Junior Bantams. Cake That Bradford raffled off an exclusive personally signed Bradford City shirt cake. The prize was drawn over Christmas and the winning ticket number was 60. The raffle raised £131 for Junior Bantams. Thank You to Cake That Bradford & Tony McMahon for their support of Junior Bantams. For more details about Cake That Bradford: Cake That Bradford. Friends of Bradford City were the official match day sponsor for the fixture against Rochdale on Saturday 9th December 2017. We had a sponsor table in The Legends Suite where members of Friends of Bradford City enjoyed a 3 course dinner, Q&A with Terry Dolan and presented the match sponsor shirt at the end of the game. Friends of Bradford City are the official match day sponsor for the fixture against Rochdale on Saturday 9th December 2017. We have a sponsor table in The Legends Suite on the day where guests will enjoy a 3 course dinner, pre-match entertainment, Q&A session with a Bradford City legend, present the man of the match after the game and so much more! If you are a claret or amber member of Friends of Bradford City you were automatically entered into the draw. Congratulations to Tony King, Peter Leskovac, Jeannette Parkin, Lynn Davison & Paula Thornham who have all won a pair of tickets each to join us in The Legends Suite! Wakefield Walking Football Club recently held a charity event to support 25 year old Wakefield sportsman Danny Pennington and his partner Judy Davis with fundraising for the Teenage Cancer Trust and Weston Park Cancer Charity in Sheffield, where Danny successfully underwent 6 months of regular chemotherapy treatment for a rare form of tumour on his left arm. Danny and Judy themselves did a Coast to Coast Cycle Ride to raise funds. Bradford City have now kindly donated a signed shirt to be auctioned off to raise further funds for Weston Park Cancer Charity. The bidding has now CLOSED for this shirt. Friends of Bradford City are proud to continue their support of Bradford City's Academy by sponsoring the back of the shirts on a 2 years sponsorship deal until 2018. FoBCFC are committed to supporting our young players and helping the academy to develop talent in the area and for the football club. Cake That Bradford have teamed up with Tony McMahon who has chosen to help raise money for Junior Bantams. Cake That Bradford are raffling off an exclusive personally signed Bradford City shirt cake. Raffle Tickets are just £1 each and can be purchased through Helen Broome, Friends of Bradford City, Junior Bantams and the 1911 reception at Valley Parade. The prize will be drawn at the Boxing Day match and the winner can choose their preferred date for the cake to be made. For more details: Cake That Bradford. Get your FoBCFC away scarf to go with the classy away kit for this season! FoBCFC today launched the new scarf for the season. As we already have the classic bar scarf within our range it seemed like a great time to launch an away scarf to match this season’s eye-catching away strip. Get yours today for just £10.00 in our shop. Remember ALL our profits go back to the Club and its’ affiliates as our committee is made up of 100% volunteers. Friends of Bradford City can confirm that they will be hosting the annual Player of the Year Awards for the 2017-18 season! Having had such wonderful evenings over the past few seasons we are really looking forward to another fantastic season of football and a great awards night to top it off at the end. We will post further updates nearer the time.